The first Metro train from Noida to Greater Noida could run as early as this December, three months before the March 2018 commissioning date, reports Vandana Keelor. The 29.7-km corridor to be dubbed Aqua Line is racing to the finish line and, according to the DMRC, will be the fastest Metro project built in India in less than two-and-a-half years. Cooperative institutions, including nearly 75,000 housing societies in the Mumbai metropolitan region, have to share their records under the Right To Information (RTI) Act with the Aurangabad bench of the Bombay high court ruling that these establishments come under the purview of the transparency legislation. The urban development ministry has formulated a national policy framework for transit-oriented development (TOD), which promotes living close to mass urban transit corridors like the Metros, monorail and bus rapid transit (BRT) corridors. The Centre is also holding a workshop on February 28 to brief the states and Union Territories (UTs) on the National Transit-Oriented Development Policy. Dubai International Financial Centre (DIFC) has signed a Memorandum of Understanding with Gujarat International Finance Tec-City (GIFT) to encourage further cooperation and collaboration between the financial centres.Areas of co-operation included in the MoU are the sharing of best practices of mutual interest and exchange of information on trends in relevant international financial services activities and products, within the FinTech field. 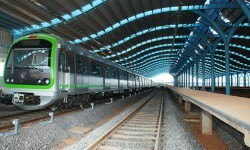 Global taxi-hailing platform Uber said it has partnered with Bangalore Metro Rail Corporation Limited (BMRCL) across 12 Metro stations to provide last mile connectivity to everyday commuters. Consumers can avail the service through exclusive Uber booking counters at metro stations, Uber said in a statement.